Ceased with: June 27, 1952. Issues for <June 25, 1952-> have title: Registration record, Securities Act of 1933 (Trust Indenture Act of 1939). 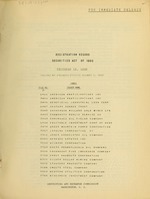 Description based on: May 8, 1937; title from cover. statements appearing in the report is issued periodically. 100 pages in any single order, and 74 per page for each page over 100 pages. In ordering, please give file number and issuer name of registration statement. securities at or before the time of the sale. I0 U A M A E 0 h .